Our friend from Arizona, Robin sent more hats, that are adorable! We are so grateful for friends like Robin, who are steadfast and always thinking of Knitting Rays of Hope! We greatly appreciate your contributions and know that they will bring smiles and spread hope! We are ending this year on a happy note, with huge smiles on our faces. When we started Knitting Rays of Hope, we had big ambitions and always wanted to donate to the City of Hope, a cancer hospital that is very close to us. 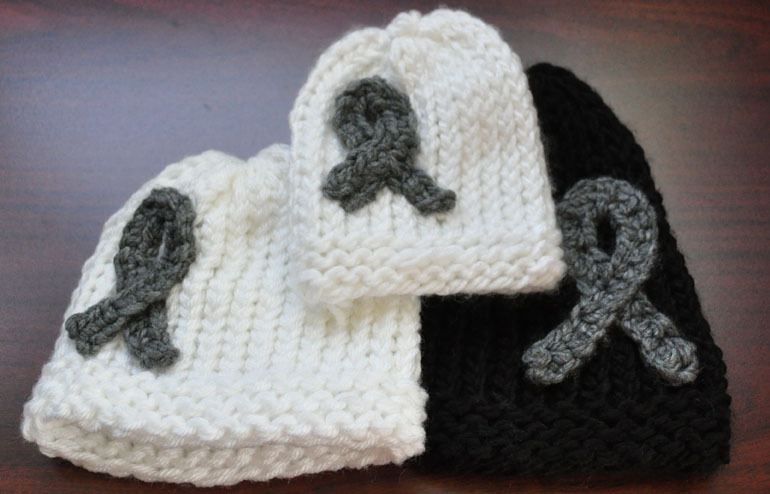 But we always wondered if we would have enough hats to meet the needs of such a huge cancer center. Last week, my mother and stepdad delivered 240 hats & scarves to City of Hope! We are so proud of this grand accomplishment. It’s our biggest delivery for cancer warriors yet, and we couldn’t have done it without you, all of our Team Hope knitters! Founded in 1913, City of Hope is one of only 45 comprehensive cancer centers in the nation, as designated by the National Cancer Institute. My folks met with Linda, from the Philanthropy and External Relations department, who was very appreciative of these hats. At City of Hope, we combine science with soul to make miracles every day. Our grand total to date is now 3,105 hats delivered! We are so excited to see how far Knitting Rays of Hope has grown! We hope that we will be able to sustain this volume to keep all our local hospitals loved and warm. We thank each and every one of our team members who helped make this possible! We are blown away by how creative, generous and caring all of you are- striving to make a difference in our world! Keep spreading hope! May is Brain Cancer Awareness Month. According the American Brain Tumor Association (link), brain tumors are the 2nd leading cause of cancer-related deaths in children (under the age of 20), second to Leukemia. There are many campaigns out there to increase awareness, educate the people, but the one message that stuck with me is: “I could be your child.” I just couldn’t imagine the anguish that these families experience. The National Brain Tumor Society (link) has a great website for education, awareness, how to become an advocate for Brain Cancer. 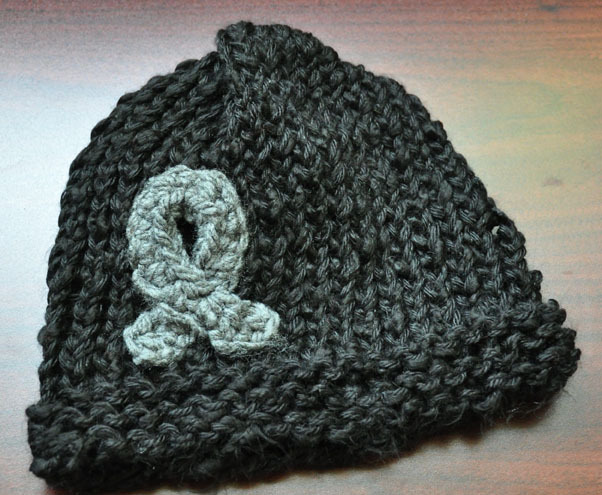 As discussed here, we are hoping to bring increased awareness, so in honor of May being Brain Cancer Awareness Month, I created this hat. I wrote up a pattern, as suggested when we participated in the Link Up Party. This is my first time writing a pattern, so if you have any feedback that could help me, I would greatly appreciate hearing it. I made this hat on a 36 peg loom for a woman. On last row of e-wrap, cut 12 inches of the yarn. Thread this yarn thru a tapestry needle, and take each stitch off the peg. When all stitches are removed from the pegs, pull the hat closed. 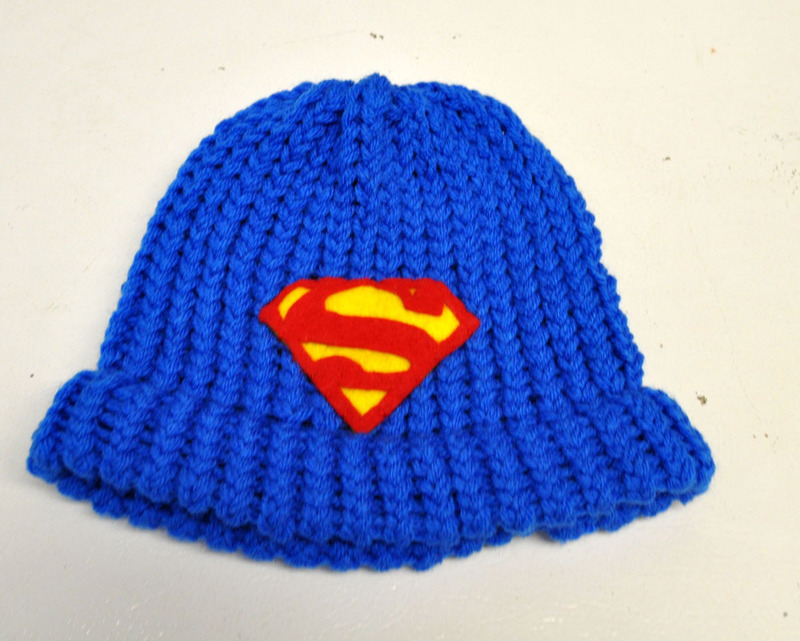 Make a cross (sew the yarn in a + at the top of the stitches) and then go in through the top of the hat. Make a knot inside the hat and cut off the excess yarn. Skip last 2 in the chain, and HDC in each stitch until you get to the beginning slip knot.